Cheesy Spinach Artichoke Lasagna, It's Easy, Satisfying & SO POPULAR! Cheesy Spinach Artichoke Lasagna, It’s Easy, Satisfying & SO POPULAR! There’s not much in life I love more than a creamy, dreamy spinach-artichoke dip. So when I found a recipe that layered the legendary dip in lasagna, my mouth instantly began to water. Instead of the traditional meat and tomato sauce, this lasagna is smothered in a cheesy spinach-artichoke dip and delicious alfredo sauce — and that’s not even the best part. I love this recipe not only because it’s surprisingly easy, but it’s also a convenient way to create a hearty meal with practically nothing to clean up. Cheesy Spinach and Artichoke Lasagna is hassle-free and full of flavor, making it every home cook’s dream come true! In just four simple steps, you can devour Cheesy Spinach and Artichoke Lasagna from the comfort of your home. It tastes even better than it looks, and foodies around the world can’t stop raving about it. Preheat oven to 350 degrees F. In a medium bowl, stir together thawed spinach, artichokes, cream cheese, Parm, garlic powder, and season with salt and pepper. In a 9 x 13″ baking dish, spoon over a layer of alfredo sauce to cover the bottom. 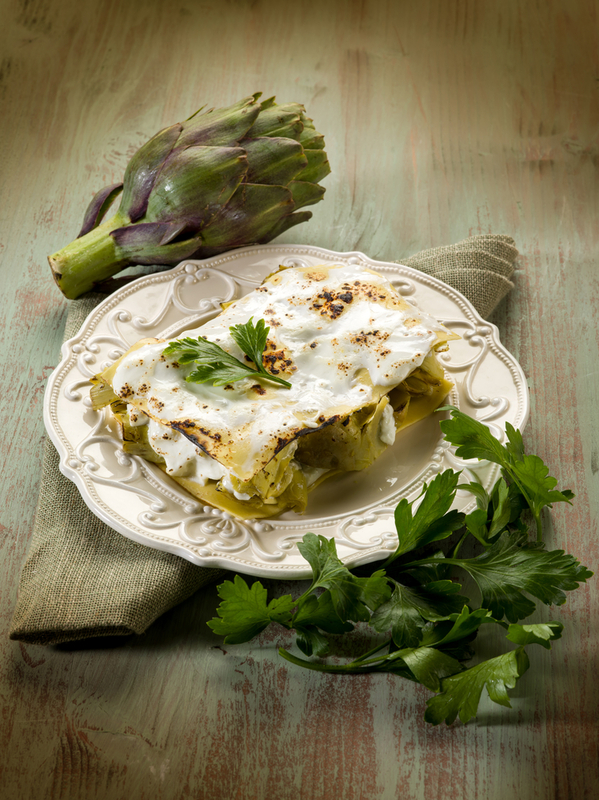 Layer lasagna noodles, then spread a layer of spinach-artichoke dip and top with a generous amount of mozzarella. Repeat layers until baking dish is full, making sure to end with mozzarella. Cover with aluminum foil and bake until bubbly, 30 to 35 minutes. Heat broiler and broil until browned, about 3 minutes. Let cool 10 minutes, then garnish with crushed red pepper flakes and slice.